Escape the Mundane in Five Easy Steps. So, your life has become slow and you don’t know how to get it to its former sharpness. You’ve come to see me because you’ve heard that I have an easy solution to your problem. Well, it won’t be easy, but it can be quick if you can think on your feet. My solution is all about thinking on your feet and being on your feet (typically running around). With my quick and (sometimes) painless remedy, your days will never see dullness again. What I recommend is getting into the Screwball Comedy Lifestyle to feel better. Screwball comedy films were extremely popular in the 1930s and ’40s. Their stories often involved a “battle of the sexes” plot along with quick and witty dialogue, steamy chemistry, and some kind of quirky/over-the-top storyline. In many screwball comedy films, the story revolves around a couple of people who madly in love with each other but find themselves in at least one humongous misunderstanding or disagreement – enough to put their relationship or marriage in jeopardy. A properly-lived screwball comedy relationship/marriage will require insane romantic chemistry, a zany brain, and an undeniable hunger for adventure. Despite the fighting, arguing, and possible cross-country shenanigans, you will eventually fall back into each other’s arms – I guarantee it. Find someone who will run after you like Joel McCrea’s character does in The Palm Beach Story (1942). Dorky glasses = cool glasses. No argument. 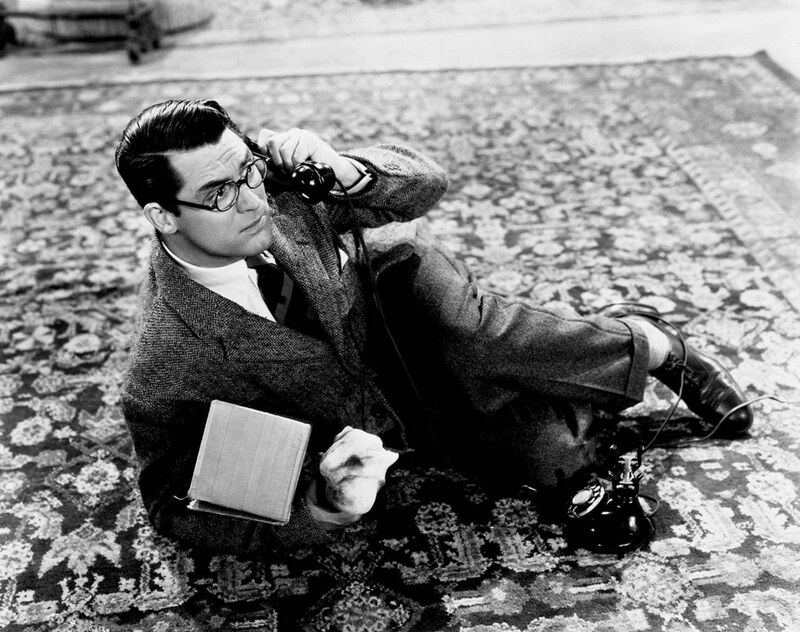 A prime example of this is Cary Grant in Bringing Up Baby (1938). Wear something like this and you’re on your way to become screwball amazingness. Run around like a maniac in the middle a high society party with these glasses on and you’re set for life. As painful as it may sound (I warned you!) this will get you far in a screwball comedy lifestyle. You’ve got to sit by a person like Mr. Shapely from It Happened One Night (1934) at least once in your life. It may be horrible at the time, but you will look back at it and laugh. This one is at your own risk, but it’s highly recommended if you would like to live out a complete screwball comedy lifestyle. You certainly do not have to go out and pull an Arsenic and Old Lace (1941) stunt, but do so if you please and only if it enhances your life. Throw stuff, yell, etc. If you want to go a step further, tell someone that he/she looks like Boris Karloff and see what happens. This post was originally published on Odyssey on August 30, 2016. By the way, the scene from The Philadelphia Story made my afternoon! I’m one of the few people who has never seen it (shocking, I know! ), but now I definitely have to! You must check out THE PHILADELPHIA STORY. TCM airs it pretty frequently, so if you get that channel it looks like it’ll be airing in about a month. I hope you enjoy it! They really are! They’re especially wonderful to watch when you’re feeling down and need a laugh. 🙂 If I could live in a 1930’s screwball comedy, I would in a heart beat! What a world that would be! Do you have a favorite screwball comedy? It’s so hard to choose! I think I’d have to go back and re-watch a whole bunch of them before making a decision. Do you have a favourite? Love screw-ball comedies and these are some of my favorites! The whole Boris Karloff gag is hilarious!! !